I recently visited two openings for artists I met at Open Studios last fall and whose work reflects my interests in highways, architectural images and the urban landscape. The artists take very different approaches, and the shows were in very different parts of the city – but having both openings on the same night was a great opportunity to see them together and simultaneously reflect upon the city itself. First, I stopped in the relatively quiet West Portal neighborhood for a show at the Greenhouse Cafe featuring Sonja Navin. Navin draws on her architectural background to capture familiar images of the city in her paintings. 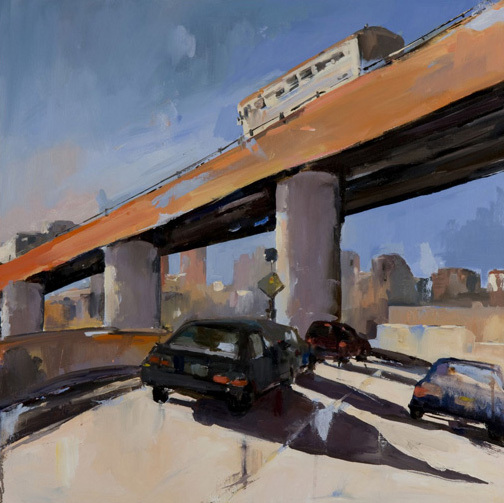 Perhaps the most “familiar” image was the King Street off-ramp from I-280 in her large painting entitled 280. Navin experienced this interchange the way many of us do, i.e., being stuck in traffic, and thus had the opportunity to visualize it in detail. She also had a painting East on N which featured a familiar view along the N-Judah metro line in the Sunset district. Although her subject matter is often architectural in nature, her painting style features large brush strokes and irregular areas of color rather than the straight lines and precision of architectural drawings. She also had several figurative paintings, and some such as In The Haight combine both character and street elements. Navin’s exhibition, which also features artist Kacie Erin Smith, will be on display at The Greenhouse Cafe, 329 West Portal Avenue in San Francisco through April 30. After brief ride over Twin Peaks, I found myself descending into the Mission district for an opening at City Art Gallery, where I was particularly interested to see new works by Mike Kimball. 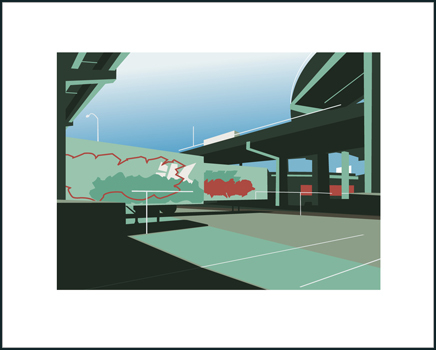 Like Navin, Kimball’s interpretation of the urban landscape distills it down to basic elements, but his prints and paintings feature very clean lines and simple geometric shapes. 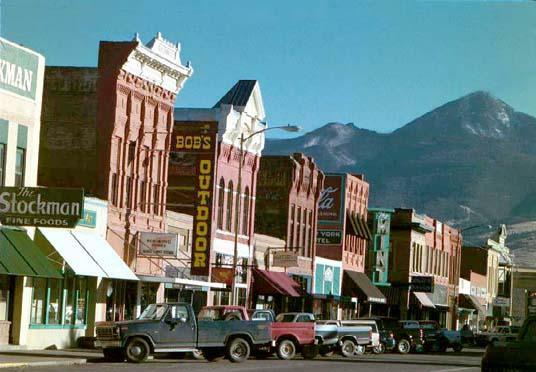 One example is his Maritime Plaza, which I immediately recognized (it is a favorite out lunch spot of mine). 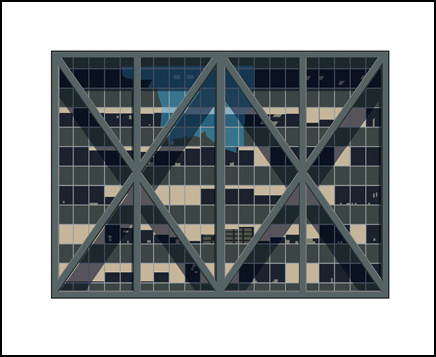 Like the building it represents, the image is framed by the triangules and X-shapes of the seismic bracing. This was one of the first buildings to use this technique, which is now a familiar site on buildings in the Bay Area. In Division Street, Kimball represents another familiar sight from daily life, the interchange of I-80 and US 101 that sits above Division Street in SOMA. The image is composed of very simple curves and lines and solid colors, from which one can distinguish the elevated structures of the highway and the shadows they cast, as well as details such as the markings (and probably graffiti) on the sides of the trailers. Trucks and trailers also feature prominently in Kimball’s work. His “Truckograph” series features a similar graphic quality to Division Street. His larger work Meditations on a port looks at the stacks of trailers at the port as an abstract collection of boxes. Kimball bridges the industrial and abstract in this work – close up, one can see the writing and metal texture, but from a distance one simply sees the colored squares. Kimball’s current exhibition will be on display at City Art Gallery, 828 Valencia Street, through March 28. We return to a favorite topic here at CatSynth with a highway interchange that we know quite well. The Alemany Maze is the large interchange in southern San Francisco between US 101 and Interstate 280. It derives it’s name from Alemany Boulevard, which runs parallel to 280. In the upper-left corner of the interchange is a large lot that is home to the Alemany Farmers Market, which has been operating at this location since 1947. I wish it wasn’t only on Saturdays (indeed, it would be great if it operated on a weekday evening to pick up fresh ingredients for dinner on the way home from work). Beyond the lot is 5lowershop (pronounced “flower shop”), where I performed two years ago at the headphone festival. I will be performing there again in October. The section of the I-280 north of the interchange is the last double-decker freeway in the Bay Area. In the years since the infamous collapse of the I-880 Cypress Freeway in the 1989 earthquake, the other double-decker freeways have been torn down, leaving only this far less controversial section of I-280. You can read more in this article. Whenever I drive to work (sometimes I take BART), I pass through this interchange on I-280. Besides it’s largeness and the annoyance of having to change lanes just to up against the freeways and the ramps. The houses on Charter Oak are actually on a steep hillside, so are somewhat sheltered from the freeway, though they also have a rather direct view of the double-decker section. All these houses are part of the Bayview District of San Francisco (also known as the Bayview-Hunters Point District), which extends east from 101 to the bay. I can only imagine that these house all pre-dated the construction of I-280, which was built in the late 1960s. More information on the history of I-280 can be found at California Highways.